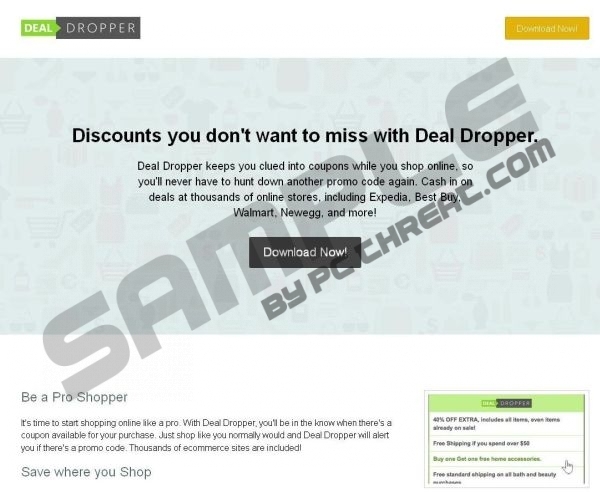 Deal Dropper is a suspicious browser application which currently is not available from its download page. Even though some may think that this would stop Smart Apps, the developer of the plugin, from having the extension distributed, the reality is completely different. As our researchers have discovered, the add-on could be dropped onto your personal computer after installing bundled software. Even though it is most likely that you would be notified about additionally offered software, you need to be cautious about any illegal, unauthorized installations. Have you downloaded the plugin from deal-dropper.com before the download link was corrupted? Either way, we recommend having Deal Dropper removed. The suspicious browser plugin is available from Google Chrome, Internet Explorer, Mozilla Firefox and Safari users. Once installed onto the computer, it starts collecting data about your virtual preferences and habits, so that personally interesting offers and ads would be presented to you. According to the alluring information presented on the official download page, the application is meant to hunt down allegedly useful virtual coupons which you could cash in at thousands of online stores. Even though the services may seem authentic and beneficial, it does not mean that you can let your guard down. In order to delete Deal Dropper from the operating Windows system, you need to figure out the best way to ensure that it is removed successfully. If you have little to no experience with undesirable software, we recommend automatic malware detection and removal software. If you believe you can remove Deal Dropper manually but you suspect that other unreliable applications could be running, utilize a malware scanner which will help you examine the operating system. Talking about manual removal, the steps you need to perform are listed below. If you have any issues with these, make sure to leave a comment below. Now select Uninstall to have Deal Dropper removed. Right-click the application you wish to delete from the operating system. Quick & tested solution for Deal Dropper removal.